SEATTLE - On an upper floor of Amazon’s Day 1 tower, foosball tables and beanbag games dot the shared spaces filled with mostly young employees and, occasionally, their dogs. Looking through tinted windows to downtown streets below, the workers can see five new Amazon buildings under construction in the three city blocks immediately around them. The new buildings – four towers and a low-rise – will house some of the 9,000 new employees the company plans to hire in the near future. They will add another layer to the explosive growth that has made Amazon Seattle’s largest private employer and taxpayer in less than a decade. Two miles to the east, in the historically African American Central District, the impact of Amazon’s rapid expansion is visible. A chain-link fence surrounds Earl’s Cuts and Styles, signaling the neighborhood landmark is slated for demolition. In its place will rise an upscale apartment building, similar to two across the street that cater to tech workers and other professionals who have been supplanting middle- and working-class black residents. Seattle’s tech boom accelerated the change, and African-Americans now make up about 15 percent of the Central District’s population, down from 21 percent when Amazon arrived in 2010. Amazon’s rise in Seattle has earned it a mixed reputation as both a progressive-minded, economic godsend for the city and a self-centered behemoth contributing too little to address the disruption it helped create, analysts say. But Amazon also draws much of the blame for pushing up housing costs and homelessness, aggravating traffic and even diluting Seattle’s identity as a quirky, laid-back city. Its contradictory record offers a guide to what northern Virginia and the Washington region can expect as the company builds a headquarters facility in Arlington, Virginia, bringing with it at least 25,000 jobs during the next 10 to 12 years. In the Central District, barber Earl Lancaster said he is “blessed” because he will be able to remain in the community where he has worked for decades. A bank building nearby has offered him space on its ground floor to keep his shop open. Amazon has actively promoted the use of public transit, such as by paying the full cost of its employees’ fare cards for light rail, buses and ferries – a perk that it is considering extending to new employees in Arlington. The company boasts that only a quarter of its Seattle employees commute to work by driving solo. Nearly 1 in 3 use transit, and more than 1 in 5 walk. The company has promoted social causes such as gay rights, in line with Seattle’s political and cultural leanings. 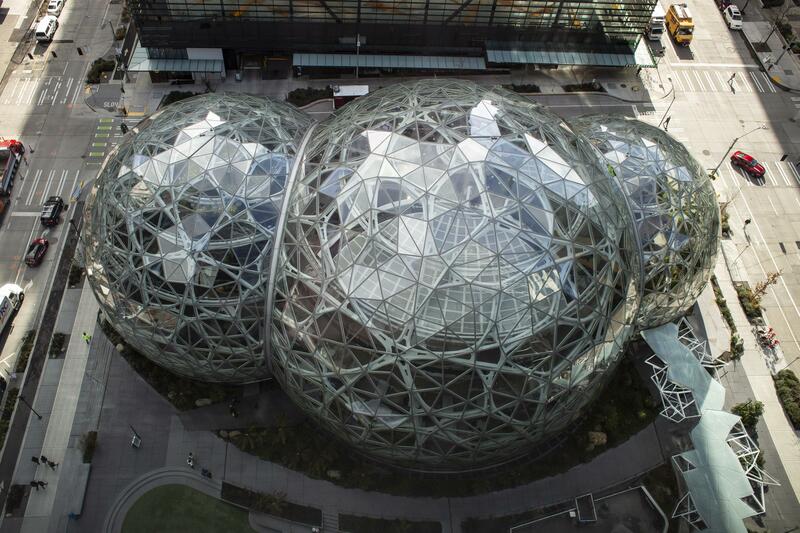 Its interest in environmentalism is evident in its construction of three biospheres – multistory, glass-enclosed conservatories where employees can take their laptops and work or relax, surrounded by 40,000 plants. The company’s philanthropic initiatives reflected a desire to be more publicly engaged as it matured, after an early period when it focused mainly on its internal growth, according to business leaders and nonprofit executives. Bezos, whose net worth reportedly exceeds $140 billion, increased his individual philanthropic giving in September by announcing he and his then-wife, MacKenzie, would contribute $2 billion to a fund to assist homeless families and preschools for low-income communities. (The couple divorced this month.) The fund’s first round of donations, for homeless families, totaled $97.5 million for organizations in 16 states and Washington, D.C., according to its website. One award of $2.5 million went to a group in Seattle, the Refugee Women’s Alliance. The arrival of tens of thousands of well-paid workers – earning what residents call “tech money,” or average total compensation of more than $150,000 a year for Amazon employees – has sent rents and housing prices soaring. The effect has been compounded as other tech giants – including Google, Expedia and Facebook – have expanded operations here to tap the tech talent attracted by Amazon. “Even though people complain about Amazon being so big and sort of taking over everything, people feel a lot of pride in this hometown company that’s done so well,” Myers said. Over the past five years, Seattle has ranked third in the nation in the widening of the income gap between the richest 20 percent of households and the poorest 20 percent, according to an analysis of census data by Bloomberg. San Francisco and San Jose ranked first and second. Asked what Arlington should expect with Amazon’s arrival, Scholes said the company, though generally private, will be more engaged in civic life than it was at first in Seattle.